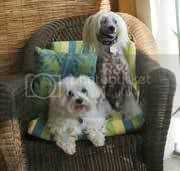 My chinese crested is 7 years old. He is a very handsome boy but he is covered with blackheads and skin tags. I have taken him to a vet dermatologist and was told he is healthy and as long as he is not bothered by the condition the best I can do is special shampoo. Please can anyone offer and answer to eliminating some of the blackheads!!!!!!! Edited by Paulette Martsolf, 15 March 2019 - 07:17 PM. What a handsome boy you have! My Bailey also has horrible skin -- blackheads and little whitehead looking things that are not whiteheads and don't pop. Vet isn't concerned with the whitehead looking things -- indicated it had something to do with hair follicles. When Bailey gets a bath, I do give him a brown sugar scrub, which seems to help with the blackheads. When I first got Bailey, his skin was far worse and he was diagnosed as having a staph infection. We have a dermatologist appointment scheduled for next month (it was a 6 week wait to get an appointment). I just want a second opinion and confirmation that there is nothing to be worried about. Bailey's skin problems seem to bother me far more than they bother him. LOL! I will keep you posted if I learn anything new from out dermatologist appointment.